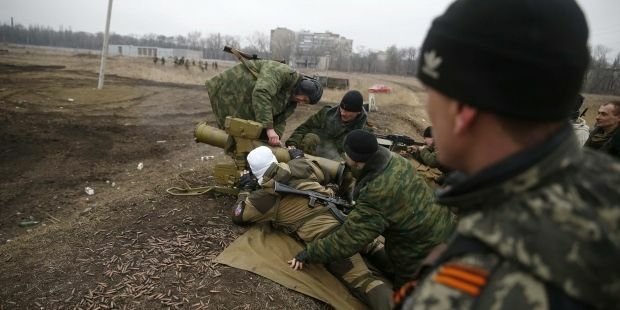 The situation in the Donbas conflict zone is worsening, with militants firing mortars and artillery on the positions of the Ukrainian armed forces, National Security and Defense Council spokesman Andriy Lysenko said at a briefing in Kyiv on Tuesday, according to an UNIAN correspondent. "The situation in eastern Ukraine is tending to worsen. The militants regularly fire on the Ukrainian army along the demarcation line, except the eastern part of the Luhansk region," he said. According to Lysenko, on April 6 Russian-backed militants fired 122mm mortars five times. There were also three cases of attacks from cannon artillery, as well as the use of tanks by militants. "All of the above mentioned types of weapons should have already been withdrawn from the demarcation line under the Minsk agreements," he said. "The tensest situation remains in the direction of Donetsk, including near the Donetsk airport," Lysenko said. According to Lysenko, in the area of Luhansk the militants are trying to find weaknesses in the Ukrainian defense lines near the Bakhmutka highway. "In the area of Mariupol the militants are trying to occupy the village of Shyrokino, but the Ukrainian soldiers successfully defend the perimeter and repel all the attacks of the militants," he said.